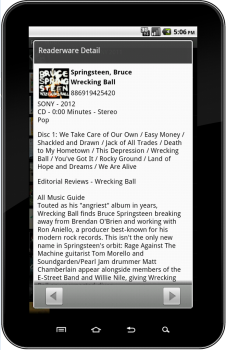 Now you can take your Readerware databases with you on an Android device. You're fully mobile, take your Readerware databases with you when you visit your favorite brick and mortar stores. You can easily check your databases to identify the titles you already own and the titles you are looking for. You setup your Readerware Mobile database format in the desktop version. Select Preferences, then Mobile. You choose which fields to include in the mobile database. A default set of common fields is provided to get you started, but you have full control over which fields to include. You can also set maximum lengths for each field. So for example you could choose to include the product info field, but only take the first 200 hundred characters to conserve space. The first time you run Readerware on your Android device, the database chooser is displayed. You can also select the Menu->Database option at any time to display it. Connect - Transfer your database over your home WiFi network. Readerware must be running on your computer and you must have enabled the network sync option in Readerware Mobile preferences. Connect your Android device to your WiFi network and enter the IP address of your computer to connect. Your computer IP address will be displayed in Readerware Mobile preferences. The current database will be transferred. If you are running Readerware Client/Server Edition you can sync your database to your Readerware server instead of Readerware itself. Follow the above instructions but enter the IP address of your Readerware Server and a port number of 9002. Import - You can also export your Readerware database. Connect your Android device and copy the exported file, just drop it at the top level of the device or in the Readerware folder. Don't bury it in any other folders. When you select the Import function Readerware Mobile will find the file, create the database and open it. The file you copied will be deleted so you don't have to worry about cleaning it up. Note: You may have to disconnect your device from your computer after transferring the file. Android can restrict file access while connected and Readerware may not be able to find the file. List - Use the List function to display all available Readerware databases on your device. You can open any database and delete old databases. 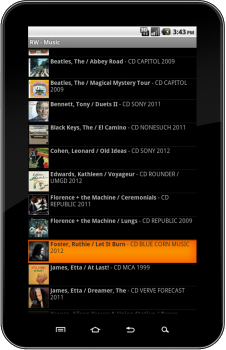 When you start Readerware Mobile your full database is displayed in a list format. You can scroll up and down and also take advantage of fast scrolling. If you have a large database the Android scroll thumb will appear when you start to scroll, drag the thumb. To scroll down to items beginning with the letter "S", drag the thumb and release it when the letter is displayed. You can also search your database, select the Menu->Search item. Select the type of search and enter what you are looking for. Readerware uses wildcard searches so just enter the first few letters of an author or part of the title and Readerware will display all matches. Click the Android Back button to return to the full list. To display more information on a particular item, just touch it and the Readerware detail view is displayed. You can scroll through your items from the detail view. Click the Android Back button to return to the full list. You can customize how Readerware Mobile works. You can choose the default search and sort for your database, customize the display, orientation etc. Select the Menu->Settings item to customize Readerware Mobile. When searching for items in your database, you can use the device camera as a barcode reader. On the search screen touch the Scan Barcode & Search button and scan the barcode. Readerware will select the correct search type and search the database for the item. It is important to understand that when searching your database by ISBN/UPC, you are searching for a particular edition of a book, album or video. You might have that title but a different edition with a different ISBN/UPC. Normally it is best to search your database by title, author, artist etc. You can also capture barcode scans and use them with auto-catalog, select the barcode button to start capturing barcodes. Take your device to your shelves and scan the barcodes. Readerware automatically saves the scans and you can use them with Readerware auto-catalog on your desktop to add new items to your database. Start Readerware auto-catalog and on the item input page, click on the Upload button and select Readerware Mobile from the list. In Readerware Mobile touch the Upload button on the capture screen and the barcodes will be transferred over your home network and automatically appear in Readerware auto-catalog. The barcodes you scan will be saved to a file on your device. Book barcodes are saved to a file called Books.rwb, music barcodes to Music.rwb and video barcodes to Videos.rwb. You can also copy these files to your computer. Connect your Android device to your computer via the USB cable and drag and drop these files to your hard drive. You can then select them in auto-catalog. Note: The first time you try and scan a barcode you might be prompted to install the Android barcode app from the Android Market. Once the app is installed you will be able to scan.